Thomas Friedman is a Great Man: Important science anniversary on Friday -- 49 years . . . Important science anniversary on Friday -- 49 years . . .
A big event took place 49 years ago tomorrow. NASA is reportedly planning to place a small space station in the moon's orbit by the mid-2020s. The "gateway" facility would make regular manned missions to the moon more feasible, USA Today reports, as more private sector companies get into the business of sending stuff into space. "What happened to the commercial launch industry is about to happen to the commercial lunar industry," Bob Richards, CEO of Moon Express, told the paper. "I think there are very strong analogies between the two." Wouldn’t that be JETSONS-like? Rushing through the sky. Around and around. :D Not exactly but closer to what so many of us used to think we’d be seeing when we were adults – back when we were little kids watching THE JETSONS. Oh well, it’s not like THE FLINTSTONES was historically accurate either. Bob Richards remembers watching the gray, ghostly figures bounce across his family’s black-and-white TV screen nearly a half-century ago: Neil Armstrong and Buzz Alrdin, the first humans walking on the moon. I’ve got JETSONS on the brain. I keep hearing the theme song in my head. A friend at work, Cary, told me that the sky tomorrow night is supposed to be like it was on the 20th – we’ll be able to see the moon and Jupiter just like it was then. That's pretty amazing. Thursday, July 19, 2018. 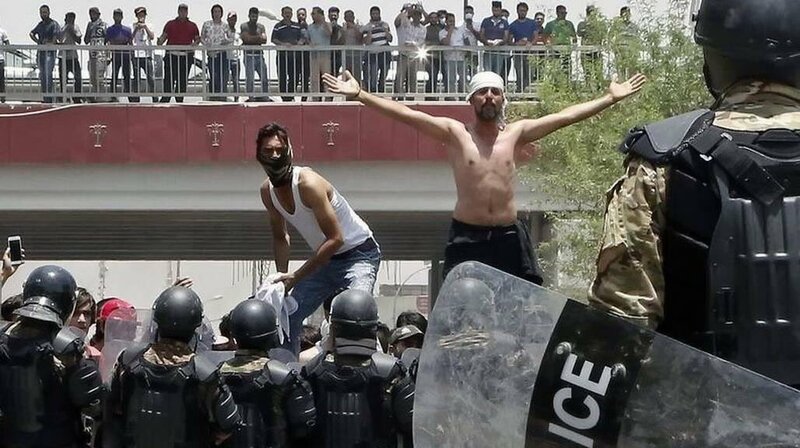 Protests continue in Iraq. 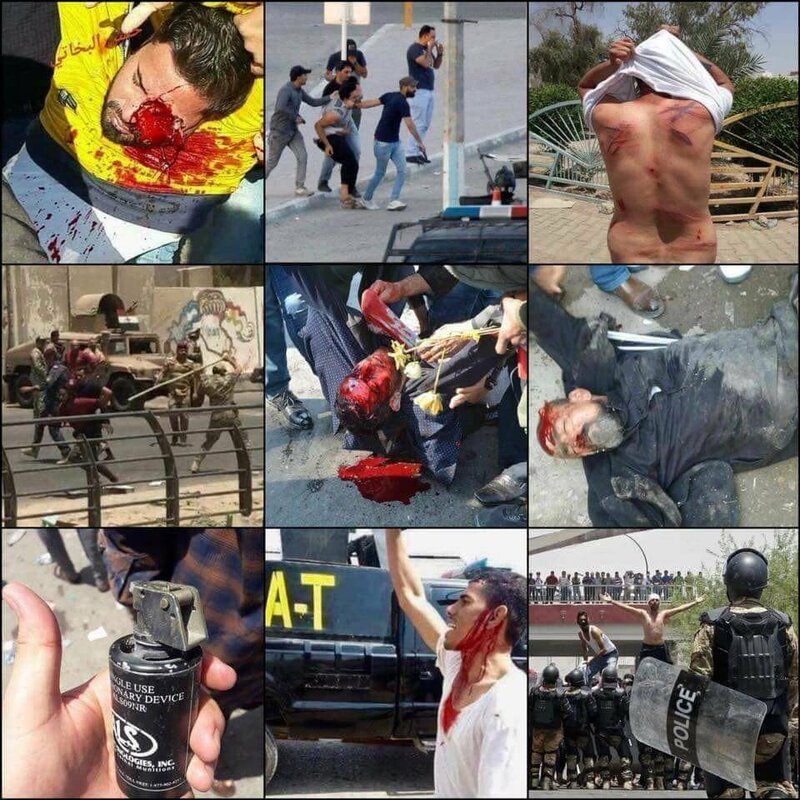 As the US media remains uninterested, let's remember what happened last time the US media ignored attacks on protesters in Iraq. 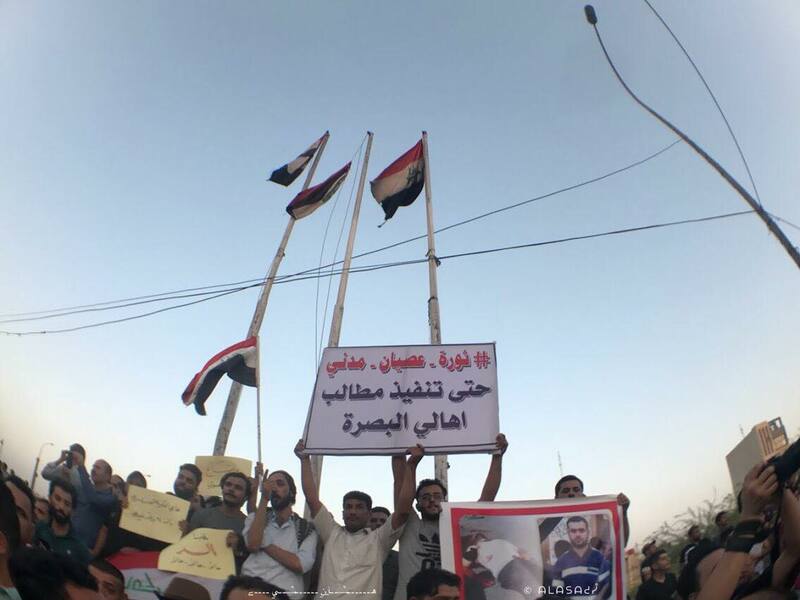 In Iraq, the protests continue. The protesters are still greeted with violence from the government that claims to represent them. 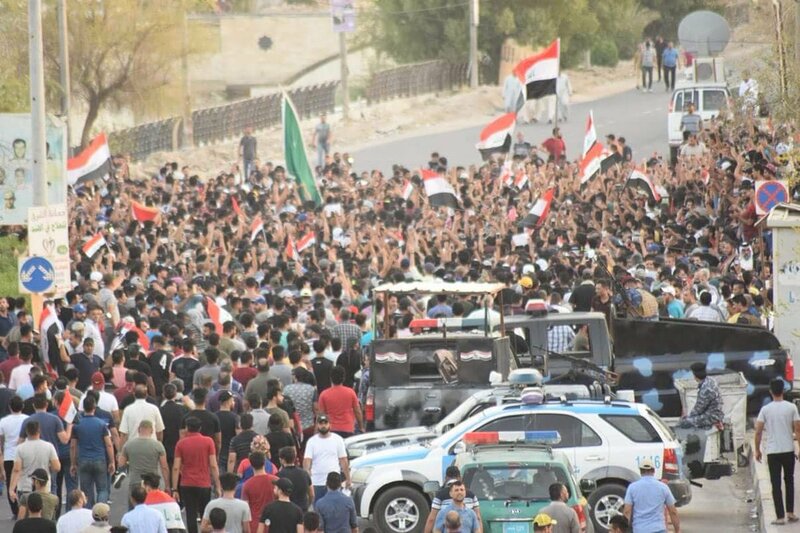 This despite the support for the protesters from Grand Ayatollah Ali al-Sistani and Shi'ite cleric and movement leader Moqtada al-Sadr. Protesting over the lack of jobs, lack of water, lack of electricity and so much more means they are targeted with violence. That's an interesting photo above. It is even more interesting if you pull back a little. The bravery of the two protesters is even more evident if you pull back just a little. It's again interesting how the protests in Iraq just do not matter to the United States. The US media largely ignores them. Whether it's corporate media or beggar media, they find something else to feign interest in. They are the reason so many have died. Not just in these protests going on now but in all the earlier protests since 2010. 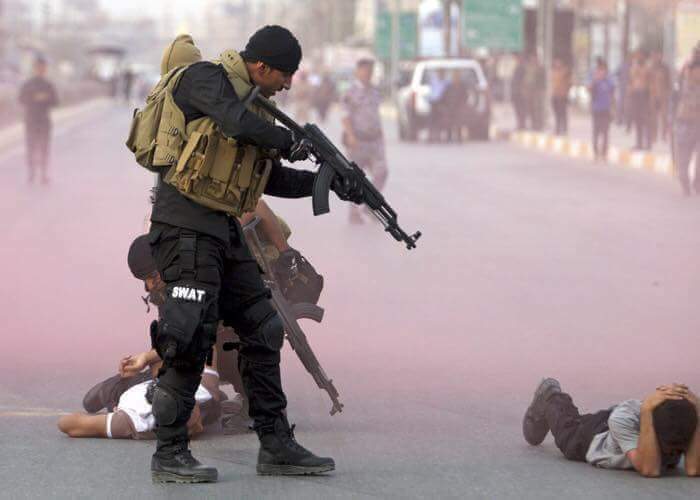 Why is Hayder al-Abadi, prime minister of Iraq, deciding to attack the Iraqi people a surprise? When Barack Obama installed Hayder al-Abadi in 2014 -- a fact even NPR acknowledged on air (it's MORNING EDITION earlier this year, if you need to look that up) -- it was known that he was Dawa -- Nouri al-Maliki's political party -- and that he was State Of Law (Nouri's political slate). Barack was removing Nouri (finally) because his persecution had led to the rise of ISIS. Why did anyone think that Hayder would be any different from thug Nouri? For all the people late to the party on ISIS this year, let's note something that they apparently do not know or else forgot. Hayder is attacking the protesters. Do we remember when Nouri started attacking the protesters? Those of us with functioning brains do remember. What happened was ISIS showed up. In public. 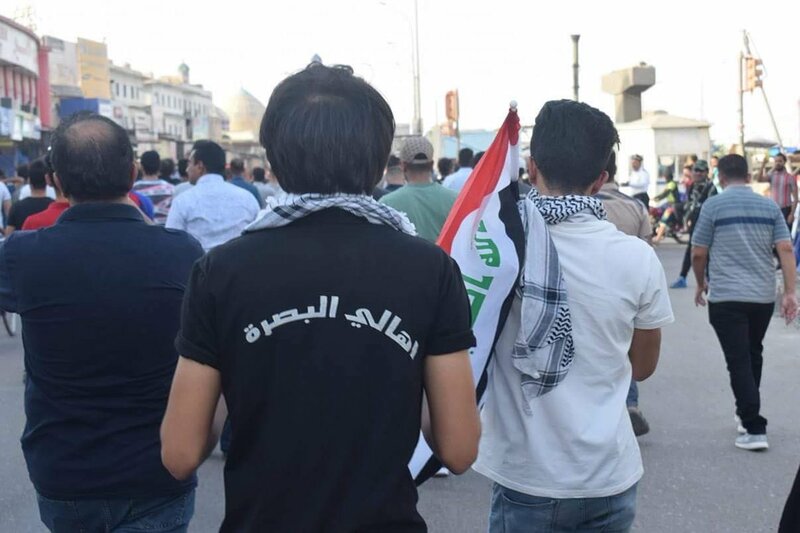 They showed up on the long highway into Baghdad where Anbar citizens were protesting and being targeted by Nouri. They showed up and protected the persecuted. Nouri's War Crimes made a terrorist group (ISIS) look better by comparison. Those valid statements above by Hanaa should be heard and responded to. Instead, Hayder's attacking the people. Hayder's traveling down that same road Nouri did. He needs to stop or be stopped. (I'm not referring to murder, I'm referring to the international community speaking frankly and, if he continues this, they cut off aid.) It's bad right now. But if it continues, it's going to get worse just as it did under Nouri. That main photo above we've noted before. It's huge on Arabic social media. Strange that the US media seems unconcerned and doesn't rush to inform Americans what is become a rallying point in the Arabic world. Look, over here, I'm waiving my hand and saying "Pay attention!" I was doing that when ISIS was rising in Iraq, before terms like "ISIS" were being used. I'm not a prophet. I'm someone with common sense (at least a little). Anyone with common sense can tell you that things are going to get worse if Hayder's attacks on the protesters continue.That's basic analysis. I see that, as usual, whenever anything takes place in Iraq, 'analyst' Joel Wing just posts links. That's because he requires months and months to form any sot of opinion -- and when he does, he's generally wrong. Like he was about Barzani. Over and over, Joel stalls and stalls and the events pass him by. But because he offers conventional wisdom, he's treated as a seer. He can't see beyond his own toes. ISIS never left. It was not defeated. People are starting to notice that and insisting it's creeping back (again, it never left and it never was defeated). 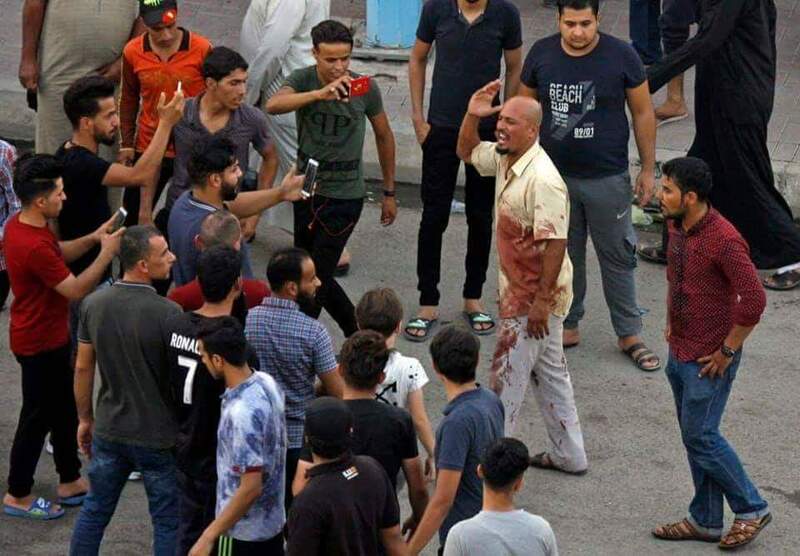 AL BAWABA reports, "At least 10 people were injured in four bombings in Iraq’s oil-rich city of Kirkuk, police sources said on Wednesday. A spokesman of Kirkuk Police, Afsaryav Kamil, told Anadolu Agency that roadside bombs were planted by unknown persons." THE NEW ARAB adds, "Anadolu news agency reported that four explosives were detonated, including one on the Baghdad road, but made no mention of mortar rounds." Because earlier this week, Liz Sly and Mustafa Salim (WASHINGTON POST) noted of Hayder al-Abadi's claims that ISIS has been defeated, "The government declared the Baghdad-Kirkuk road is now safe, and drivers and passengers who take the route say there are new checkpoints every kilometer." NETFLIX the never-ending ponzi scheme?